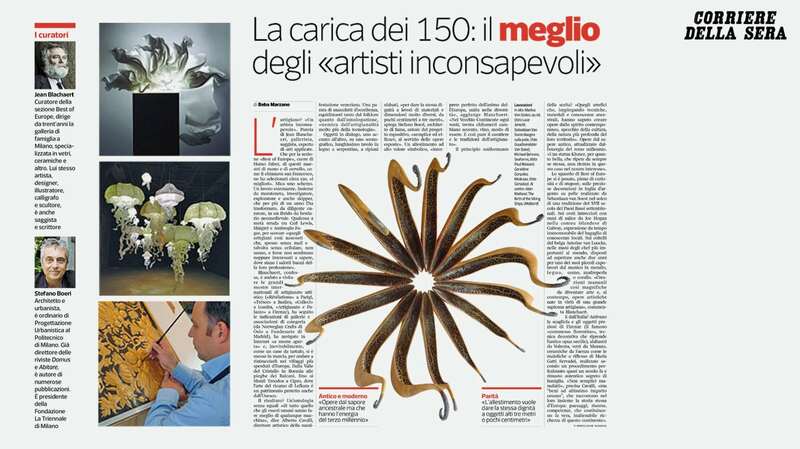 On Corriere della Sera a page about Homo Faber, the event dedicated to craftmanship and promoted by Michelangelo Foundation that will inaugurate on September 14th in Venice San Giorgio Island, at Fondazione Cini. A selection of 150 among the best European artisans, “unaware masters” selected by Jean Blanchaert who made an intense exploration that took him visiting the most remote places of Europe and the most famous artistic craft exhibitions: Révélations in Paris, Trésor in Basilea, Collect in London, Artigianato e Palazzo in Florence. An anthology unprecedented “of everything that human beings do better than any machine”, says Alberto Cavalli, art director of the exhibition. The set up designed by Stefano Boeri Architetti proposes a sinuous multi-layer ribbon with a variable section “to give the same dignity to works with very diverse materials and dimensions, from few centimeters to three meters”, explains Stefano Boeri, “simple and efficient, in the service of the exhibited works”. An high symbolic value set up which aims to add value to the multitude of aspects that characterize craftsmanship.